If you’ve ever wondered how to support a young person with vision impairment (VI) to enjoy equestrian activities, then look no further. 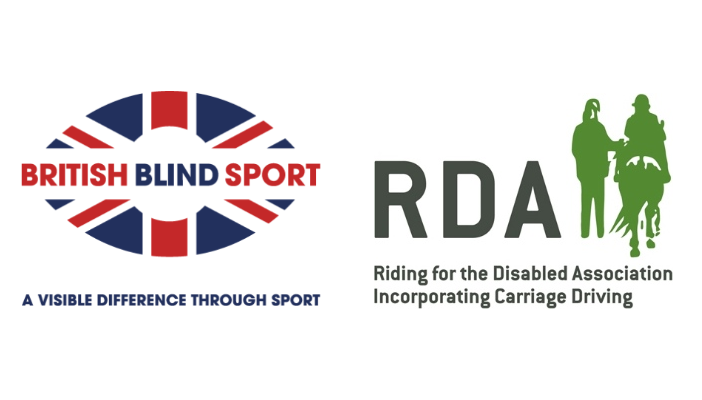 A guide by British Blind Sport (BBS) and Riding for the Disabled Association (RDA) has all the answers. Equestrian activities such as horse riding, vaulting (gymnastics and dance on horseback) and carriage driving can develop a number of skills, improve self-esteem and create enjoyable experiences. With the right support and adaptations, people of all abilities can participate. The publication, called “A Guide to Delivering Equestrian Activities for Visually Impaired People”, advises on topics such as the importance of verbal communication and best way to coach people with VI in equestrian activities. Along with considerations around environmental factors, equipment and facilities, it also provides tips on promoting your activities through the right channels and formats. Always remember to introduce yourself by name even if you have met the participant before. And think about the acoustics of the area and whether you can be heard effectively. Don’t be afraid to ask about a new participant’s level of vision and whether their vision impairment is acquired or congenital, as this could affect their knowledge of horses and what to expect from sessions with you. Speak directly to the participant rather than a carer or anyone else, and always remember that people with VI might not be able to see visual cues, such as a smile, and therefore you need to replace these with verbal feedback. A two-way radio can be a useful communication aid, especially in large areas or large/mixed groups. Try to establish if there is a preferred situation or environment that promotes better vision, such as changing where you stand when explaining a task to someone who has better vision in one eye. Consider the amount of available light and also changes in light; such as cloud cover and time of day, all of which can affect the ability of a person with VI to take part. Think about the level of background noise and the likelihood of unexpected or unusual noises. Some surfaces (for example sand) will give very little sound from the horses’ hooves, and some people with VI may prefer to work of a surface that offers more auditory feedback. Try to clearly establish the boundary of your arena, for example by placing white boundary boards along the walls, painting the walls a different colour to the arena surface, or painting the fence white so that it stands out better against the background. Make sure that equipment is returned to the same place each time to help establish routine. Try alternative ways of describing exercises, for example using a clock face analogy to help the learner to visualise it. Wherever physical contact is required or would add value (for example for adjustment of hand position), make sure that the participant is comfortable with this first. For full details and to discover other equestrian tips on how to promote a trusting relationship between a rider with VI and horse, on mounting/dismounting and orientation and more, download the guide. British Blind Sport enables blind and partially sighted people to have the same opportunities as sighted people to access and enjoy sport and recreational activities in the UK. Riding for the Disabled Association's horses and ponies provide therapy, achievement and enjoyment to people with disabilities all over the UK. Guide to tennis for blind and partially sighted players. Inclusive playground games all children can enjoy. Physical education and vision impairment: overcoming obstacles.